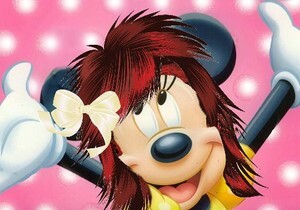 Minnie 쥐, 마우스 with Red Hair. A modified picture of Minnie that I added hair to. Wallpaper and background images in the 어린 시절 애니메이션 영화 여자 주인공 club tagged: photo disney heroine animated film minnie mouse. This 어린 시절 애니메이션 영화 여자 주인공 photo contains 부케, 코사지, 꽃다발, posy, nosegay, and 코 사지. There might also be 장미, rosiness, 장미 빛, 속 hippeastrum, 속 hippeastrum puniceum, hippeastrum, hippeastrum puniceum, 동백, 카멜리아, 낙타, and camelia.